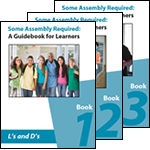 LDAO publishes materials related to learning and learning disabilities – books, workbooks. All of the items below are available for purchase through this website’s online store. This workbook series helps adults with LDs find out what sorts of employment suit their learning style and interests, and helps adults prepare for a better Job-Fit. To order your Job-Fit book today select this link. 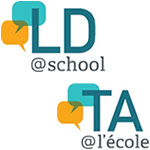 LD@school and TA@l’école are new web resources developed for Ontario educators working with students with learning disabilities. The websites are developed by LDAO and funded by the Ontario Ministry of Education. Each website features resources produced with the Ontario educator in mind. Specific resources include: evidence-based/evidence-informed/practice-informed summaries, videos, webinars, tip sheets, student success stories, and links to other helpful resources. A series of workbooks exploring learning and LDs for students in grades 6-8. Topics include LDs, study skills and the transition to high school. Informational snapshots about a variety of LD related topics and issues. Free to use and share. This is the Face of LD was a series of posters which once graced the front page of this website. The series tells the stories of six individuals who all have learning disabilities. You can view them here.